CJI Dipak Misra, who was presiding the bench comprising Justices AM Khanwilkar and DY Chandrachud, said he as the Chief Justice of the Delhi High Court had heard the case pertaining to 2G spectrum allocation and hence, would not like to hear the instant petitions. New Delhi: Chief Justice of India (CJI) Dipak Misra today recused himself from hearing the pleas of Karti Chidambaram, son of former Union Minister P Chidambaram, and two firms challenging Enforcement Directorate's decision to provisionally attach their properties in connection with a money laundering probe in the Aircel-Maxis deal case. The CJI, who was presiding the bench comprising Justices AM Khanwilkar and DY Chandrachud, said he as the Chief Justice of the Delhi High Court had heard the case pertaining to 2G spectrum allocation and hence, would not like to hear the instant petitions. "I have heard the 2G case in Delhi High Court," the CJI said. The bench said another bench headed by Justice Arun Mishra, which is already seized of a similar case, would hear the present matters. Senior advocate Anand Grover, who was appointed by the top court as special prosecutor in the 2G cases and was representing the ED, told the bench that a similar matter was listed on January 16 before the bench headed by Justice Mishra. 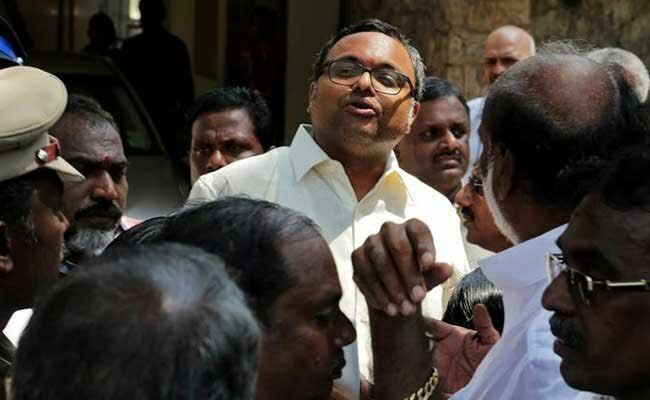 Karti Chidambaram and two companies, including Advantage Strategic Consulting Private Ltd (ASCPL), have challenged the ED's decision to provisionally attach their assets under the Prevention of Money Laundering Act in connection with alleged proceeds of crime in the Aircel-Maxis deal. The probe agency, on September 25 last year, had attached assets worth Rs 1.16 crore of Mr Chidambaram and a firm allegedly linked to him in connection with the probe in the Aircel-Maxis deal case. A provisional attachment order, signed by Joint Director and investigating officer of the 2G spectrum allocation cases Rajeshwar Singh, was issued under the PMLA for attaching the assets. The case pertains to the Foreign Investment Promotion Board (FIPB) approval granted in 2006 by P Chidambaram, with the agency saying it was probing "the circumstances of said FIPB approval granted by the then finance minister". The agency had said FIPB approval in the Aircel-Maxis FDI case was granted in March, 2006 by the then finance minister even though he was competent to accord approval on project proposals only up to Rs 600 crore and beyond that it required the approval of the Cabinet Committee on Economic Affairs (CCEA). "In the instant case, the approval for FDI of 800 million USD (over Rs 3,500 crore) was sought. Hence, CCEA was competent to grant approval. However, approval was not obtained from CCEA," it had alleged. It had also said a payment of Rs 26 lakh was made by Aircel Televentures Limited to ASCPL, the firm allegedly linked to Karti, within a few days of the FIPB approval. The agency is probing the Aircel-Maxis deal under the PMLA after taking cognisance of a 2011 CBI FIR in the case.